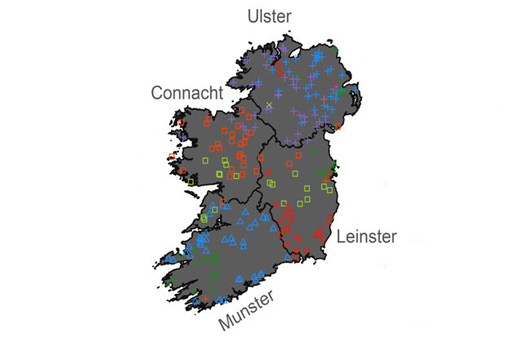 In a study published late December in the journal Scientific Reports, researchers have found 10 genetic groupings that mirror the ancient and medieval boundaries of Irish kingdoms: Ulster, Leinster, Munster, and Connacht. The study was explored by a team of Irish, American, and British scientists that analyzed data from 194 Irish people with four generations of ancestry tied to specific regions on the island. As well as the wars and rivalries that the Gaels had participated in, the Ulster Plantation made an impact, as researchers found that population mixing occurred around the 17th to 18th centuries. A distinct Irish genetic landscape began during the Bronze Age when people living on continental Europe migrated across the English Channel and the Irish Sea. Do recent DNA tests support the claims of Ulster Loyalists who would have us believe that they are as racially different from their Nationalist neighbors as Eskimos are different from African Ibos?